Jose Reyes surges while David Wright struggles. How much longer will this be the left side of the infield? It was an interesting ninth inning at Citi Field on Sunday afternoon. The Mets trailed 4-1 with one out and a runner on first when Jose Reyes gave the crowd some life with his third triple of the weekend. There was life in the ballpark and hope for a sweep rose as Reyes lifted himself from the base to applause. Alas, the comeback wasn't meant to be. Carlos Beltran pinch-hit and popped out to shallow right and then interim Dodger closer Vicente Padilla pumped a fastball past David Wright to end the game with a disappointing strikeout. That Wright failed in that spot isn't all that surprising. He went 3-for-19 on the six-game homestand and his strikeout rate of 28.7 percent is even higher than the dismal totals of the past two seasons. So that's not why the ninth inning was interesting. The ninth inning was interesting because it made you wonder if all the recent talk about Reyes's imminent departure from Queens hasn't been a case of simply taking the easiest possible route to a lower payroll. His contract expires at the end of the season and everyone has all but made peace with the fact that he'll be gone as a free agent or via trade, but his play thus far in the 2011 season has made that an extremely depressing thought. He is back to being the player who assaults opposing pitchers and controls games at the plate, in the field and on the base paths. What's more, he's a player whose game is tailor made for Citi Field. Every ball into a gap is a bid for a triple, a play that is both exciting and a good way to set the table for the players in the lineup who follow Reyes to the dish. Even when you take into account the real fears about Reyes's ability to keep playing like this and remaining healthy, it is hard to believe that you'd just let a player born to play in this stadium walk away without a fight. That leads us back to Wright. Wright's game is not a perfect fit for Citi Field, which is why we're continually hearing about moving the fences in and making it easier to hit home runs. It's always seemed backwards to build the stadium around current players, but these are the Mets so we can't assume that means they'll see the folly of this approach. 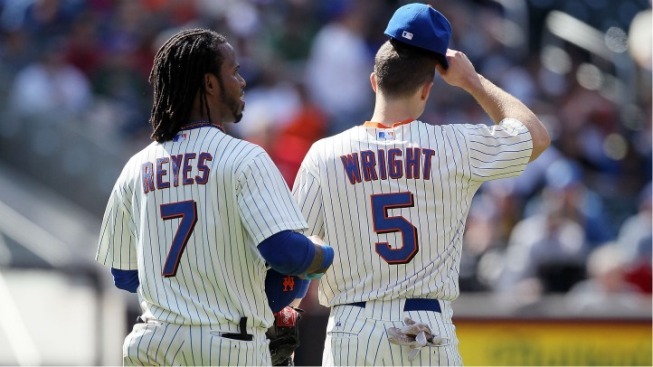 It comes up a lot less than with Reyes, but Wright has been the subject of trade rumors as well this season. At some point, Sandy Alderson and his brain trust will need to figure out which, if any, of the two cornerstones is the best one to send packing before the end of the 2011 season. Wright, at 28 and with a contract already taking him through the 2013 season (assuming an exercised club option), could fetch more in a trade than an expiring contract or the two draft picks that the Mets would get for letting Reyes walk. Those prospects could also be closer to the big leagues and closer to helping the Mets turn the corner back to a winning record. The trade of either player would surely be met with some serious disgust from portions of a fan base that's been through a lot over the years. You could sell it as a painful-but-necessary step toward the future. The question is, which of these guys is the best one to lead them to that future?